The mortuary temple of Queen Hatshepsut known to ancient Egyptians as Djeser-djeseru; the 'sacred of sacreds', was built by the first female pharaoh of ancient Egypt. Located in the bay of cliffs known as Deir el-Bahri, Hatshepsut strategically placed her temple, on the banks of the Nile, a short distance from the Valley of the Kings and on a direct axis with Karnak Temple. In true reflection of Hatshepsut's amazing accession to the throne, the temple's architecture and beauty outshone any other; proudly displaying the glory of Hatshepsut's reign. The temple has three terraced levels connected by two ramps and a path which led directly to the Hatshepsut's tomb in the Valley of the Kings (KV20). The temple has rows of vertical colonnades which, (as can be seen from the picture on the left) reflects the structure of the mountains behind it. Each side of the lower incline used to have papyrus pools and the ground floor used to contain sphinxes and fragrant trees. Beyond the colonnades of the first court, is a ramp which leads into the second court and various statutes and reliefs of Hatshepsut including ritual scenes with birds, a net of waterfowl drawn by two gods, Hatshepsut offering statues and driving calves to Amun. The temple is dedicated to Amon and Hathor (who Hatshepsut claimed were her parents) although there are chapels dedicated to other gods such as Anubis, the god of embalming and sailing ships (Barques) carrying statues of Tuthmose I, II, III and Hatshepsut. Barques of the "Theban Triad" are carried by priests and have a procession of offering-bringers, dancers and musicians. The temple also contained various personalised structures;sphinxes had the head of Hatshepsut, reliefs depicted Hatshepsut as a lion and Hatshepsut is also shown clawing at adversaries and capturing "birds of evil". Interestingly the walls of the temple were left blank so that as Hatshepsut's reign as Pharaoh progressed, key events could be mapped onto the walls. 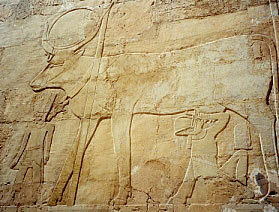 However many of the reliefs and structures were either destroyed or altered by Tuthmose III, Hatshepsut's successor. Daughter and favourite child of Tuthmose I, Hatshepsut cleverly took advantage of events, to enable her reign as the first female Pharaoh of Egypt. Hatshepsut was one of three children (from King Tuthmose I and Queen Aahmes) but both Hatshepsut's brothers died, before the death of their father Tuthmose I. However Tuthmose I had another son Tuthmose II (from commoner Moutnofrit) so that after the death of Tuthmose I, Tuthmose II ascended to the throne with his wife and half sister Hatshepsut as his Queen. In the northern part of the upper terrace there are chambers devoted solely to the solar cult of Re-Horakhty. In one of these chambers there is a large alabaster ( white decorative stone) altar which would have been used to place sacrifices on, as the altar's position would have exposed the sacrifices to the sun. Whilst the southern side of the upper terrace is designated as the area housing the royal mortuary cult and includes cult chapels of Hatshepsut and her father Tuthmose I. The ramp leading to the third terrace has Horus falcons along the side of it and The columns in front of the third terrace are decorated with statues of the Hatshepsut. At Karnak Hatshepsut built two obelisks (tapering rectangular stone columns) ornamented in fine gold to honour Amun-Re. In recognition of this document the erection of the colossal obelisks at the temple of Karnak. These show the transportation by ship of two obelisks from the granite quarries at Aswan. The same wall also contains images of the queen offering the obelisks to Amun at Karnak along with the dedication ceremonies. Tuthmose II's reign was short and he passed away without producing offspring with Hatshepsut but he had a son from commoner Isis. Tuthmose II's son;Tuthmose III was young when his father died, creating the perfect opportunity for Hatshepsut to use her influence and turn her reign as Queen dowager, into reign as King and Pharaoh of Egypt proper. As King and Pharaoh proper Hatshepsut dressed in the traditional suit of a male Pharaoh the shendyt kilt, the nemes headdress with its uraeus and khat headcloth. Hatshepsut even went as far as wearing a false beard. At times Hatshepsut would be referred to as 'he', or the feminine ending to the word for 'majesty' would be added, images/structures of Hatshepsut in the temple show Hatsheput dressed as a male Pharaoh as can be seen in the picture below left. "I will make you to be the first of all living creatures, you will rise as king of Upper and of Lower Egypt, as your father Amon, who loves you, did ordain". and her work to repair damage inflicted by the Hyksos invaders. Hatshepsut's tomb even depicts the night Tuthmose I in the form of Amon approached Hatshepsut's mother and impregnated her with the seed that created Hatshepsut. In the southern colonnade of Hatshepsut's temple are the scenes of Hatshepsut's expedition to Punt (thought to be located in/near present day Somalia on the east coast of Africa). These expeditions in search of amongst other things the ivory, gold and aromatic trees that Egyptians yearned for, were undertaken to prove her sovereignty. The original relief of the Ity fat Queen of Punt is now kept in Cairo Museum and a copy now stands in its place in Hatshepsut temple. The temple also houses a Chapel of Hathor which contains reliefs of Hatshepsut being suckled by the goddess Hathor in her form as a cow. The central part of the hall contains Hathor-headed pillars. These lead into the sanctuary of the chapel; the Sanctuary of Amun, which has been cut into the hillside at the back. On the northern wall of the Hathor Chapel scenes depict boats, a parade of soldiers, a panther and Libyans dancing in a festival of Hathor. The Sanctuary of Amun, would have contained the barque of Amun during the 'Valley Festival'. Two chambers in the sanctuary depict scenes of Hatshepsut, with her daughter Neferure (probably fathered by Senmut) and Tuthmose III worshipping various gods. Despite talent and political astute, Hatshepsut's twenty year reign was soon ended through a revolt by the Asiatic people. This revolt was halted by the Egyptians led by Hatshepsut's nephew/stepson Tuthmose III. After the revolt, Hatshepsut disappeared leaving Egypt free for Tuthmose III to take as King and Pharaoh. As part of his revenge strategy Tuthmose III defaced and attacked images and shrines of Hatsheput, which is one of the reasons why the temple of Hatshepsut needed extensive restoration. It is believed that just as in the case of Tutmose I, the tomb of Hatshepsut was built secretly by slaves who may have been killed after the construction, to prevent them revealing any information about the tomb. Such a secret construction may have protected the tomb from grave-robbers, but not from Hatsheput's her own nephew. Even the location of Hatsheput's mummy is unknown despite the fact that her tomb KV20 containing her sarcophagus (stone coffin) has been discovered. The sarcophagus of Senmut (Hatshepsut's consort who designed the temple) was completely destroyed and was found in over 1,200 pieces and his mummy has never been found.